Johnny Cash once sang,” you’re so heavenly minded that you’re no earthly good”. Most of the time I agree heartily with the Man in Black, but in this instance I must protest. And though there be some element of truth in this statement, it is not from being “too heavenly minded” that causes issues down here below. I would submit that when we are “no earthly good” it stems from a defect rather than an excess of heavenly mindedness. Our real problem is we too often mistake earth’s joys for heaven’s, and this will only result in misery and woe and fruitlessness in our service to others. In fact, the Christian knows that the only hope for this earth is the riches and the fruit of heaven. 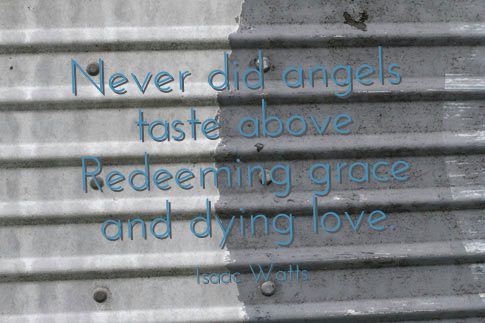 Isaac Watts understood this well, and so I share here a hymn of his. If we would be holy and fruitful in our commission upon this earth, we must forsake worldliness and feast only at heaven’s table! And feed my soul with heav’nly love. Bless’d Jesus, what delicious fare!